Spring will be here before you know it! I’m ready! 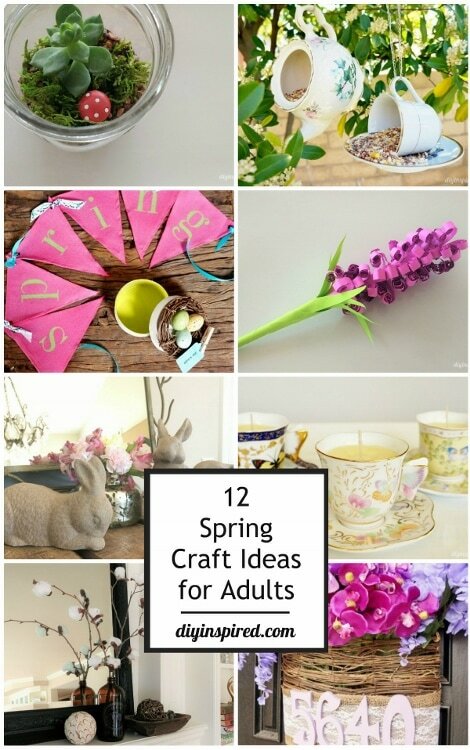 I thought I’d put together a list of 12 Spring Craft Ideas for Adults. Some are fun home décor ideas while others will make great gifts. Here we go! Make your own candles in mini tea cups in any scent you wish. Also makes a great gift. Make a spring terrarium with succulent clippings. With two dollars and a nature hike, make this rustic farmhouse statement piece for your home décor. Grow your own indoor herbs by making a window sill herb garden n a jar. Feed the birds with this stylish upcycled bird feeder made from thrift store treasures. Turn outdated thrift store ceramic bunnies into updated Easter décor. A relaxing craft, make these paper flowers that will last all season (and then some). Dress up your front door with this pretty springtime address wreath. Originally a craft challenge, make your own canvas banner with bright spring colors. Add to your Easter décor with this bunny art in any color you choose. Make a statement centerpiece with these stenciled burlap metal vase. Make whimsical flower crowns for fun to wear on Mother’s Day or anytime or to wear to an outdoor spring party. Awe! Thanks so much, Chloe!